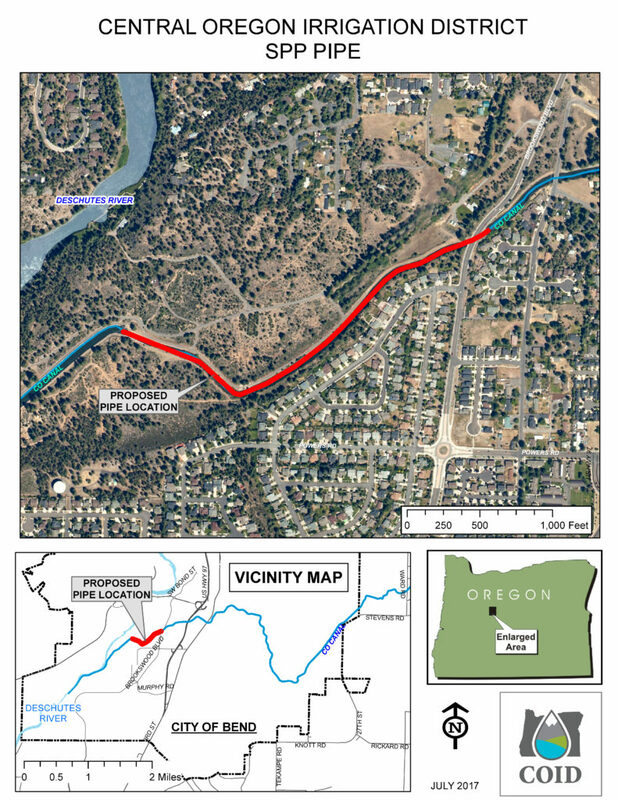 (REDMOND, Ore.) – Central Oregon Irrigation District (COID) has announced plans to begin piping approximately 3,000 feet of the irrigation canal from the Brookswood Bridge heading west. The timing of construction is dependent on the Bureau of Reclamation completing a National Environmental Protection Act (NEPA) analysis but is expected to begin in December 2017 and be completed by March 2018. According to Horrell, piping this portion of the canal will restore 5 cubic feet per second (cfs) to the Deschutes River. In addition, it prepares the property for future development that will help the District fund other conservation projects. Piping canals also reduces liability and increases safety in the water delivery system. The District will not hold back any water and 5 cfs represents 100 percent of the conserved water. The pipe will be buried at grade level and, when the project is completed, COID will restore the trail creating a recreation experience similar to the trail in First Street Rapids Park between Pioneer Park and Sawyer Park in northwest Bend. This continues a partnership between COID and Bend Park and Recreation District (BPRD) to manage Central Oregon’s water resources and consider residential and recreation opportunities. Piping this portion of the canal will cost approximately $5 million. Funding is provided by a Bureau of Reclamation grant of $1.4 million, a $3.2 million loan from the Oregon Department of Environmental Quality, and in-kind services and cash contributions from COID.